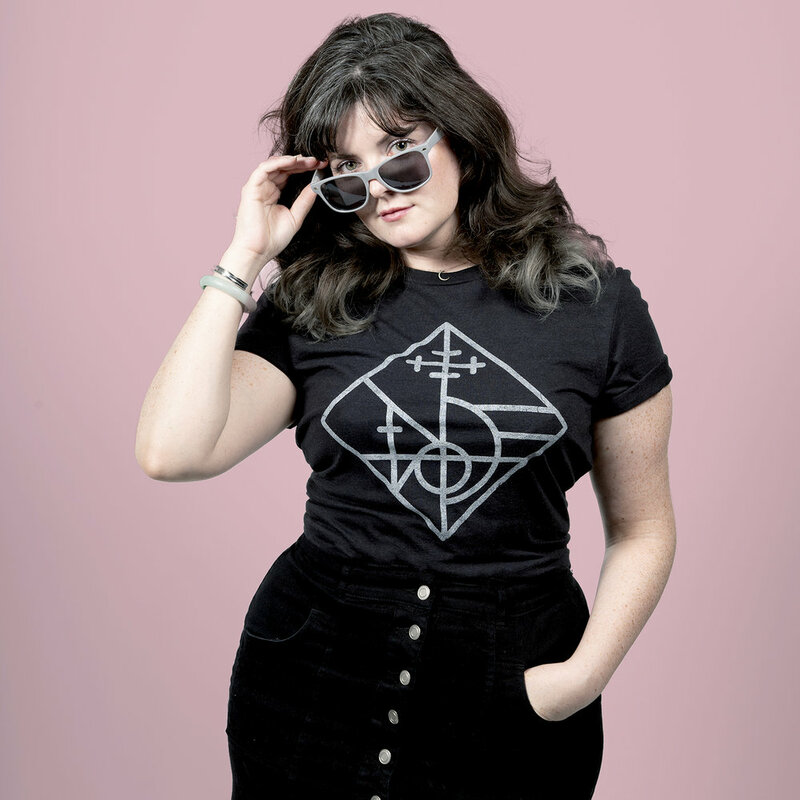 We were so excited to meet Jenny Gacy of Hauntwell at our Heartmade Harvest market last year, and we are SO happy that she’s coming back this spring! Her sigils are both relatable AND powerful and she will help you find just the right one for whatever you need. Today she shares HER favorite piece. Check it out in person on May 4th! 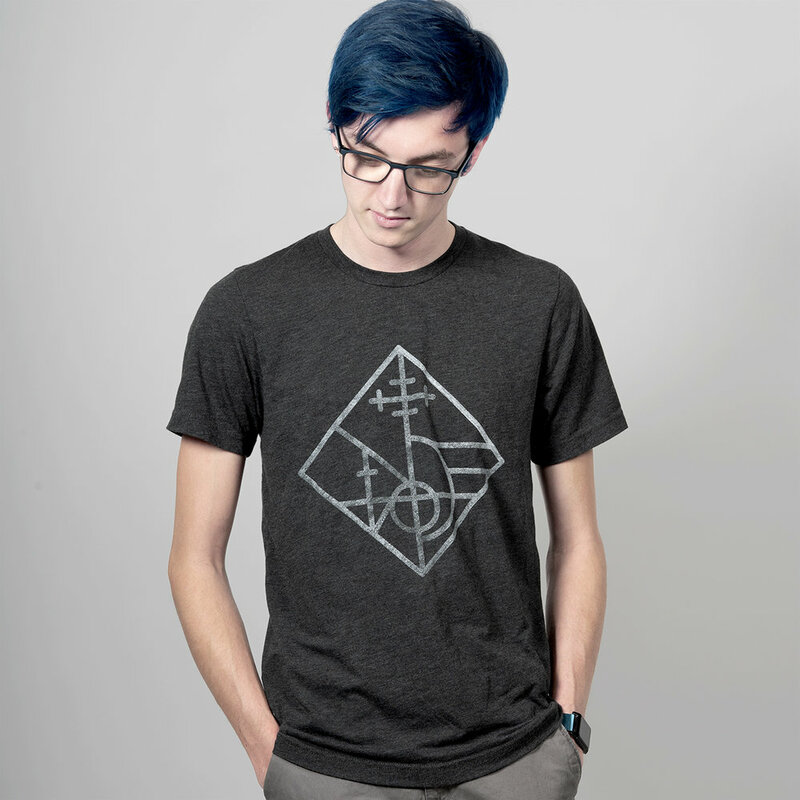 It's hard to choose, but PROTECTION FROM HIDDEN ENEMIES is probably my favorite sigil that I've created. It was one of the first ones I made, and is still my favorite daily go-to design to wear. It has a sword-through-the-evil-eye motif, and I feel like coupled with the diamond shape it really gives off a strong, powerful look that makes the wearer feel confident and bold! Perfect for warding off bad days and negative vibes. Today’s My Favorite Piece is from new Heartmade maker Haley Ognoskie of H. Lively Textiles! Haley is a self-taught designer and artist and her work is perfect for any chic Houston home. Her patterns are both bold and soothing, and the fabric she uses is printed right here in America — a soft and inviting linen-cotton blend. Come snuggle up to her booth on May 4th and take home some new accessories to make your home even more comfortable and inviting! Why? The Leslie was a revamp of a design I created years ago when I first started creating my own textiles so it has a lot of history behind it! It has become one of my best sellers because it is a perfect paring of cool and warm colors, and as a result, works with so many design schemes. Since this design has been with me from the beginning, I decided to name it after my best friend, Leslie. Our friendship started almost a quarter of a century ago! We have shared so many memories over the years so it seemed fitting! How it is made? Inspiration begins my process. From there I create the design concept via sketching, painting and palette selection. I use various art media to add the texture and color I'm looking for, and after numerous renditions, designs are perfected and digital files are created. My textile patterns are then printed in America on a high-quality linen-cotton blend fabric. Once printed, I use the fabric to create soft goods for the home. My process starts by hand and ends by hand. It is truly an honor and a blessing to get to use my hands to create for others, especially to create for one's sacred space, their home. The Leslie pattern is great for home decor pillows or framed textile art as a stand alone piece or as part of a gallery wall! It is even available as fabric by the yard for your own custom upholstery projects! Today’s My Favorite Piece comes from Heartmade favorite Robin Lively of Linkster Love! We love Robin’s adorable, hilarious, and incredibly creative pieces for both children and adults. She even gives the adults a little something naughty now and then which is how Tracy first fell in love with Linkster Love. It just so happens that Robin’s favorite piece is also Tracy’s! (Editor’s note: This is a fact. These towels hang in my kitchen. 😁) Visit Linkster Love on May 4th and grab some super cute towels for the kiddos and some fun gifts for you and your friends as well! When I started embroidery journey I knew I wanted to do designs that resembled my style and linens you would see at your grandma’s. This is one of my most favorite to stitch out, i love the cross stitch look and I love “cussy” crafts. Today’s “My Favorite Piece” comes from NEW Heartmade maker Chelsea Bumgarner of Sweet Thyme Design! Chelsea (The Spoon Lady of Austin!) will be driving down from our state capital to share her “hand stamped vintage flatware and living greeting cards” with Houston. (Yes, living! The cards have wildflower seeds and can be planted!) We met Chelsea at the incredible Cherrywood Art Fair run by our friends Chula League, and we couldn’t leave without enticing her to visit Houston for Heartmade. We know you’ll give her a warm Houston welcome and don’t forget — Mother’s Day is the weekend after our market and we think Sweet Thyme Design is just what Mama ordered! My Spoon Lady Collection is inspired by my favorite kind of stories — ya know, the ones where women save themselves, and encourage females to stand with other females in support, not in competition. Stories where being Pro-Women doesn’t mean being Anti-Men, but rather recognizing each other’s strength and redefining the word “beautiful” by empowering one another, in likeness and difference. Stories where women are so fierce that everyone else wishes they were born a woman too. I created this line of spoons during a time where I felt like I was in a rut, creatively. When this idea hit, it was like a breath of fresh air. Each Lady is different, to prove that being a strong & independent woman doesn’t look the same on everyone, and to focus on the importance of lifting each other up. I create the face of each Spoon Lady by combining individual character stamps to form a face-like shape, hammering each one by hand. We’re thrilled to welcome Erica Sandberg of Studio E Houston to Heartmade this Saturday! Her dreamy paintings drew us right in and we know they will find a lot of good homes with our fantastic customers. Visit Erica on Main this Saturday from 10-5 at Heartmade Harvest! My favorite piece that I have created recently is called “Mauvescape #1.” I had some idea of what I wanted to try to accomplish with these colors and luckily it worked! This piece is an alcohol ink painting on yupo paper. Alcohol ink dries very quickly so I had very little time to manipulate the colors to create a mountainous type landscape. After the painting was completed and dried, I mounted the yupo paper on 8” x 10” cradled birch panel. I love that this piece has so many layers and so much depth. I usually use more brilliant colors, but I really love the more muted color palette. I look forward to showing everyone more of my work in my first Heartmade market! We’re so happy to be welcoming back Heartmade artist Allison Johnston of fuzzy grapefruit! Her work often features animals in hilarious situations, like dogs dressed as famous people. (Tracy: “I own a Doggy Parton print!”) We were really proud of Allison’s most recent show featuring incredible paintings of endangered animals on entirely recycled materials. It was incredible and we’re crossing our fingers for prints at Heartmade Harvest, a week from tomorrow on November 3rd! Today’s post is about her favorite piece, which comes from that very show! This original painting was one of the pieces from a recent show I put together titled "Sacred Animal", featuring endangered species. He was a challenge for me, in a lot of ways. Although I love painting animals and they continue to be a recurring subject for me, trying to capture the emotion of this great ape was tricky -- throughout the process, I constantly wavered between feeling that I was making him "too animal" or "too human". 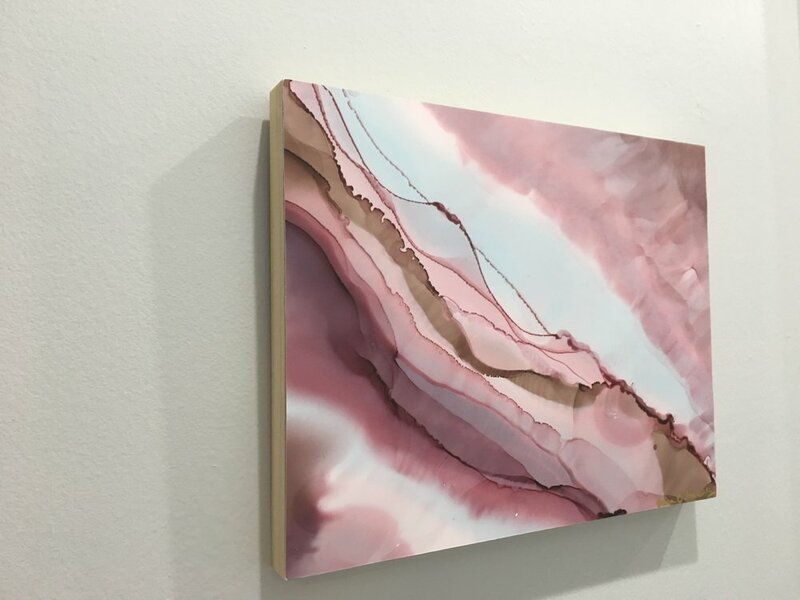 In keeping with the theme of environmentalism, I also gave myself the additional challenge of only using substrates I had on-hand for the paintings in the show. I only had a handful of wooden panels and canvases so I turned to the one substrate I had an excess of -- fabric. Obviously there's a big difference between painting on paper or panel and painting on fabric, and at first I hated it! But slowly, with practice, I began to enjoy the way the fabric soaked up paint and water and forced me to abandon finer details for larger swaths of color. Making these fabric paintings into wall-hangings was a new experiment as well! I gathered branches from fallen tree limbs in my neighborhood, sanded and dried them, then protected them with an acrylic sealant. The purpose of the show was also to draw attention to animal conservation efforts, so this series will always hold a place in my heart with its cause-driven focus. We’ve added a new category to our blogs for this market called “My Favorite Piece” where Heartmade artists could share a special work that they will also be selling at the show! Today’s post comes from new Heartmade artist Michelle Hernandez of Meechi Ceramics in San Antonio. We are thrilled that she has joined our market family and we know you’ll enjoy meeting her and seeing her gorgeous ceramics in person on November 3rd! My current favorite piece is my "bitty bowl." I especially love making these little cuties because they are small and fairly fast to make on the potter's wheel which allows me to really get into my "flow" state where I can fully be in the moment of making and not distracted by my mind chatter. They are also great to have around because you can use them for so many things! I like to keep one on my night stand for my jewelry, in the kitchen for my spice mixes and at my desk for paper clips! And that's just the beginning of their endless uses.